This is a free online chat session with one of our CBAP® recipients. The CBAP mentor will tell you of their journey to become IIBA® Certified, provide tips & tricks on anything related to IIBA Certification from the application process to re-certification. We have a few chapter members that will re-certify their IIBA certification for the first time this year. So we will take this month to talk about the recertification requirements and process. We will also talk about becoming certified; studying, the exam, and the process. Anyone interested in ECBA™, CCBA® or CBAP® certification is welcome to come and ask questions of our CBAP mentor. Aaron Whittenberger, CBAP, CSPO is an Enterprise Business Analysis and a leader in the Business Analysis Center of Excellence (BACoE) at Cincinnati Insurance Companies, where he is currently working with other business analysis leaders to develop Standards of practice and redesigning their Knowledge Center for the community of 80 business analysts. 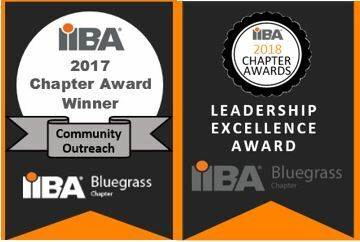 Aaron is also Co-Founder, COO and an Instructor at Business Analysis Knowledge Academy (BA Knowledge Academy), and the Founding President of the Bluegrass IIBA Chapter. He also serves as Regional Director of the Americas Eastern Region for IIBA®. Aaron is a 2016 Inductee into the Bluegrass Business Analysis Hall of Fame. He is a champion for the IIBA®, business analysis as a profession and the recognition of its practitioners. He is an avid Business Analyst, Blogger, Mentor, Trainer and Presenter. Aaron is a frequent speaker at IIBA® and corporate meetings and conferences in the region. He has over 30 years of Business and IT experience including 17 years of Business Analysis and 15 years of consulting experience; and earned his Certified Business Analysis Professional™ (CBAP®) certification in 2008. He has recertified his CBAP certification three times. Aaron lives in Northern Kentucky and has four sons. In his family life, Aaron enjoys spending time with family, and a good round of golf; we’ll see if he ever has one. You may connect with Aaron on LinkedIn: http://www.linkedin.com/in/aaronwhittenberger or Twitter: @TheWittyBA.